Come with me on a little journey. We are going to a wedding. Let’s have a seat. See the Groom up there waiting for his Bride. He looks so excited! You can see the longing and anticipation he has. Out of all the women in the world he chose this one to be his Bride. She is special, she is chosen, she is loved. He is not looking at her faults. He is not keeping a list and checking it twice. He loves her despite anything she may have done, have done, or will ever do. He just wants to spend the rest of his life with her. No matter what he wants to be part of her life and love her forever. The music starts, we all stand and look at her beauty. Here she comes. The lace, the flowers, the music, the white dress, what a beautiful couple. This is the start of their new life together. They look so good together! Then the Minister/Priest/Judge says, “repeat after me”. Groom: I (name), take you (name) for my lawful wife, to have and to hold, from this day forward, for better, for worse, for richer, for poorer, in sickness and in health, until death do us part. Bride: I (name), take you (name) for my lawful husband, to have and to hold, from this day forward, for better, for worse, for richer, for poorer, in sickness and in health, until death do us part. Beautiful ,just beautiful. aren’t weddings great? Kind of renews you hope and joy all over again. If you were ever married you remember what it was like at your wedding. If you are not married you think about what you will do at your wedding. Unless you were called to be single, then that’s good too. Have a seat. Ok, now what if you read the vows above with Jesus being the Groom? 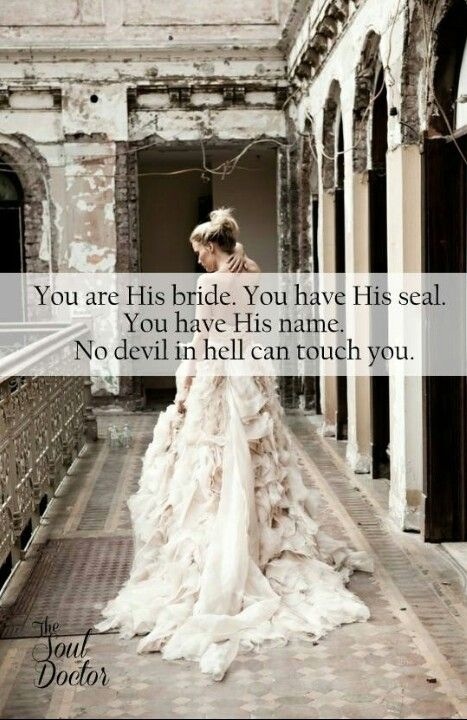 And You are His Bride. Only there is no ‘death do us part’ because He conquered Death. His death brings us eternal life! JESUS: I, Jesus, take you ________for my lawful wife, to have and to hold, from this day forward, for better, for worse, for richer, for poorer, in sickness and in health, and I will give you eternal life. I will never leave you nor forsake you. I will help you, comfort you, save you, redeem you, and give you the gift of my precious Holy Spirit. I will abide with you, and you will abide with me forever because my love for you never ends. There is nothing that can separate you from my love. I am your Prince, and you are my Princess, and we own the Kingdom! Posted in Healing, Spirituality, Uncategorized and tagged Bride, Bride of Christ, christianity, faith, God, Groom, Hope, Jesus, Religion and Spirituality, Spirituality, Wedding. Bookmark the permalink.